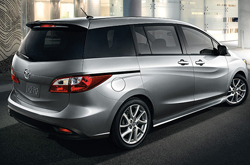 The 2015 Mazda5 is an ideal minivan for small families. It seats six people comfortably, comes with an easy-access third-row seat, features ample storage and is incredibly affordable. Due to these benefits and additional advantages, the Mazda5 minivan receives very few changes this year and reemerges virtually untouched. One of the only noticeable modifications on the new model is the discontinuation of the six-speed manual transmission, leaving the five-speed automatic as the sole option. If you'd like to read more about the van and its amenities, check out our 2015 Mazda5 review below. The latest Mazda5 may be smaller than a lot of its competitors, but when it comes to cargo space and storage, it does not disappoint. In each model the second-row passenger seat comes equipped with a fold-out center table that can be used to house items during a long road trip, as well as a storage net for storing umbrellas, kid's toys and even electronic gadgets. On top of these great features, the 2015 Mazda5 in Houston also features top-notch cargo room, delivering 44.4 cubic feet of space with the third-row seats folded down. With so much extra room, drivers can transport larger items with ease when needed. Rated at 157 horsepower and 163 lb.-ft. of torque, the 2015 Mazda5 in Houston's 2.5L four-cylinder engine is very efficient. It comes fitted on a front-wheel-drive platform and is matched with a five-speed automatic transmission that supports its performance offerings. Due to this exceptional configuration, the minivan can produce an EPA-estimated 24 mpg combined, 21 mpg city and 28 mpg highway. Its acceleration is also on par with most four-cylinder compact crossovers, proving the Mazda5 is a highly capable vehicle. Continue reading our 2015 Mazda5 review for more details about the model. Also, be sure to check out the minivan's engine specs. Compare the 2015 Mazda5 side-by-side with vehicles like the 2015 Dodge Grand Caravan, Honda Odyssey, Chrysler Town & Country and the Nissan Quest, and we're sure you'll find out that the Mazda5 ranks above the competition in a variety areas. 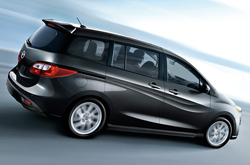 Shoppers will be won over by the Mazda5's sharp looks, as well as its convenient incar technologies. Hundreds of Houston Mazda drivers choose it because it's a fantastic value; just compare its price to the opposition. Find even more info about its specs; see our quick-facts list for the Mazda5 - bullets below this paragraph. For reviews of the 2015 Mazda5 and past models, Joe Myers Mazda is your trusted resource. 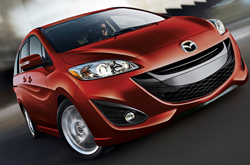 There is a reason why we are one of the Houston area's leading Mazda dealers. Just one reason is that we provide reviews authored by well-informed automotive writers. Make wise decisions when it comes to your next auto purchase - don't take guesses! Each article is brimming with facts and vehicle features in a clear format that's easy to understand. Thank you for checking out Joe Myers Mazda's 2015 Mazda5 review. Now that you know more about the Mazda5, contact us to learn about great short-term lease offers and incentives that can help you save substantially on your purchase.